For 6 existing years of the Battle Rzeszów, the current Freestyle World number 2, Klaudia Hartmanis, keeps winning her hometown event since 2011. This year, Battle Rzeszów was upgraded to the prime events category and gathered many strong riders from different countries. One more time, Klaudia showed her best, getting the victory of the Freestyle Battle and Classic Disciplines, despite the fact that she had to spend more time to study this year. 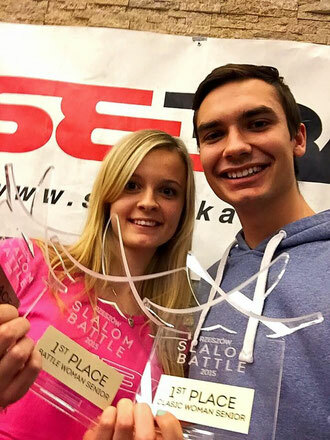 See here her feedback about the 2015 edition of the Battle Rzeszów. "I was happy about my runs", Klaudia said, "Even if I practiced only once after the WFSC 2015, I was surprised that I can still skate well, haha! I was really excited about juniors (especially kids from blue bear), because when I'm in Michal's city I am coaching them. So it was super cool to watch their efforts and then good results. For the moment there are a lot of young skaters and I hope some of them will become top skaters in future! Fingers crossed!"